In the past, data entry and tracking, employee integration and sharing documents, content approval and purchase requisitions were all basic everyday business processes completed solely with the use of paper. Before moving towards digital, documenting information involved filling out forms by hand and keeping them in cabinets, which obviously led to missing files. Recovering the sensitive information was a time-consuming process, not to mention the amount of space occupied by all those cabinets. The inefficiency of this practice is more than obvious today, when companies benefit from secure mobile apps and EFSS (enterprise file sync and share). Ordering office equipment and stationery necessitated completing a paper form and waiting for a response, which once again led to not only time delays, but also financial loss because sometimes this manual process caused the over-purchase of materials. Nowadays, employees have the possibility to use self-service portals in order to submit purchase requisitions and get their job done. 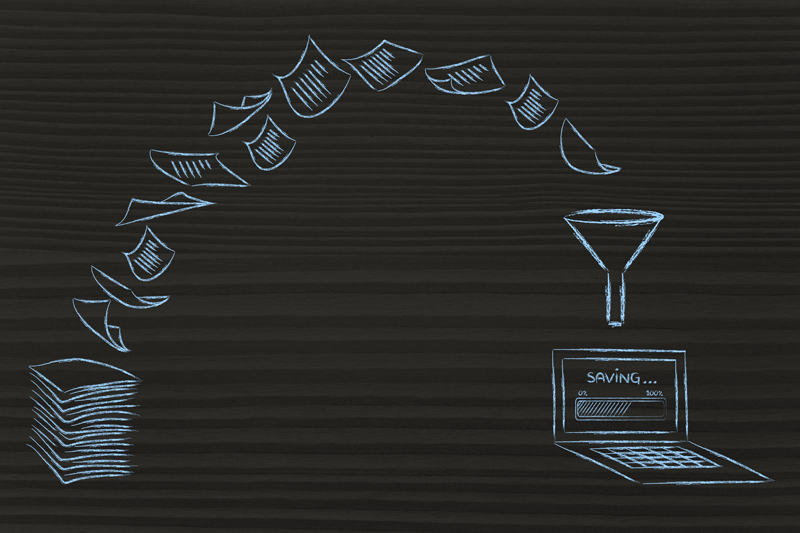 Since companies can integrate automation, paper-based operations cannot drag them down anymore. What type of business do you run? Should you go paperless? Embracing digitization has become a trend in the corporate world mostly because it facilitates data storage and control. However, before making such an important transition, you should first consider the type of business you own and run because eliminating the need of using paper might prove to be an advantageous move for some industries but an uninspired choice for others. More specifically, an insurance company or an accounting, a financial advisor and a healthcare practitioner need sensitive information at hand fast in order to meet client demand. Consequently, they spend a great amount of money on paper, which ends up occupying most of their available space. Furthermore, they invest valuable time in typing, printing and then looking for a specific document or file in piles of paper, which in most cases can provoke a headache. Electronic health records, on the other hand, have revolutionized the healthcare industry because doctors have the possibility to see and share the full health history of each patient in a timely and productive manner. However, some disagree with the fact that going paperless could do more good than bad for e-commerce businesses, for instance, because they view it as a less convenient option. How can your business benefit from digitization? With few exceptions, the truth is that getting your business in shape for digitization can prove to be a wise decision because you benefit from top-notch security, more space and money, full access, time saved and an excellent reputation thanks to your environmentally conscious image. More exactly, businesses contribute significantly to landfill waste and greenhouse gasses just by using and disposing of paper, without taking into consideration the energy required for printers to function and the ink cartridges thrown away irresponsibly. Business owners should understand that more and more consumers adopt a green lifestyle in order to minimize the negative impact on the surrounding environment and follow the example. Normally, most business owners are more interested in knowing the financial benefits offered by such a change because after all, the only purpose for owning a company is to make profit. Well, apart from the admiration and respect of competitors, companies can also captivate the attention of prospective customers while enjoying the loyalty of current ones leading to higher profits. In fact, going digital can help businesses not just make profit, but also save money because they use man-hours more efficiently, they meet client requirements easier and they tackle various projects simultaneously. How can you leverage smart digital business solutions? Business owners have numerous smart solutions available for making the transition from paper to digital smoother. For instance, Timesheet Portal represents a software that facilitates common operations of a company, from document storage and signing, online expenses and time tracking to client invoicing and holiday bookings. The best part is that since it comes with configurable options, such a software is adequate for various types of businesses including manufacturers and recruitment agencies. Tracking internal costs and margins, uploading and sending receipts, approving and managing employee’s time off, creating customer invoices, keeping track of extra hours worked by a certain employee, storing client and worker contracts no longer represent time-consuming processes causing headaches and delays. Making this transition might prove to be quite challenging for certain companies aspiring to effective digital workflows. For instance, some employees might need some time to get used to the new system because the reality is that not everyone was born with a smartphone or a tablet in their hands. Thus, the employer must inform them about the benefits of the change and help them grasp the logic behind the transition. Furthermore, the business owner should also create a plan for disposing of current files and documents, implementing strict protocol by encouraging employees to embrace digitalization and making paper obsolete.